Ink cartridge contains UltraChrome Ink that offers a high color gamut of pigment ink and boasts superior lightfastness for truly long-lasting results. This ink is the perfect solution for exceptional color and remarkable print longevity. 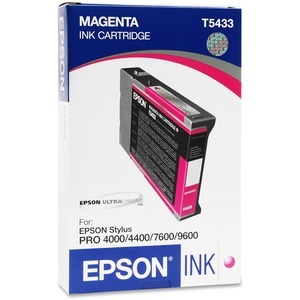 With no noticeable short-term color shift, this innovative ink consistently delivers stable, high-quality results in your Epson Stylus Pro 4000, 7600 and 9600. * Preliminary data from Wilhelm Imaging Research, Inc. indicate the lightfastness of color UltraChrome prints made by the EPSON Stylus Pro 7600 and 9600 printers will be rated up to 100 years under glass on specific EPSON media. Data indicate the lightfastness of black and white UltraChrome images printed using the 7-color mode will be rated as greater than 100 years under glass on specific EPSON media. Ink lightfastness ratings are based on accelerated testing of prints on specialty media, displayed indoors, under glass. Actual print stability will vary according to media, printed image, display conditions, light intensity, humidity, and atmospheric conditions. EPSON does not guarantee longevity of prints. For maximum print life, display all prints under glass or lamination or properly store them.Visit www.wilhelm-research.com for the latest information.